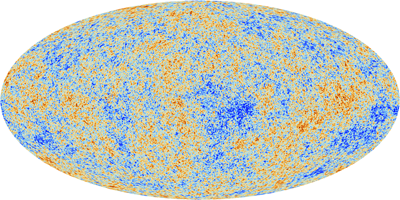 A map of temperature variations of the CMB formed from data taken by the Planck spacecraft. Red represents regions that are slightly warmer than average and blue represents regions that are slightly cooler than average. This cosmic background radiation can be seen all over the sky. The spherical map of the whole sky has been projected onto a flat oval. Click here for a larger image. Image: ESA and the Planck Collaboration. The cosmic microwave background (CMB) is often described as a baby picture of the Universe, but the comparison doesn't do it justice. Much more than a snapshot of a new-born blob, the CMB is something of an oracle. As we described in the last article the CMB confirmed that the Universe started in a Big Bang around 13.8 billion years ago and has given us vital clues as to the origin of the galaxies, stars and planets within it. But that's not all. The CMB has also shed light on the geometry of the Universe. And it has confirmed that most of the Universe consists of mysterious substances we don't yet understand — dark energy and dark matter — and told us how much of those there is compared to ordinary matter. To understand how a single picture can tell us so much, you first need to understand what physicists believe created it. As we saw in The cosmic afterglow the temperature fluctuations in the CMB trace fluctuations in the density of matter in the Universe when it was around 380,000 years old. Back then the Universe was very different from what it is like today. Planets, stars and other significant lumps of matter hadn't yet formed. Instead, physicists believe, the Universe was filled by a soup of particles. Electrons, particles called baryons, which are ordinary matter particles, and particles of light, called photons, sloshed around together and were coupled to each other, behaving like a fluid — the so-called baryon-photon fluid. This animation illustrates a sound wave. A vibrating object (for example a drum skin) pushes air molecules together as it bumps into them. The result is a compression wave propagating through space. In a given region (vertical strip) the density of air molecules fluctuates. Video from Ozzie Nevarez on Vimeo. The baryon-photon fluid wasn't entirely smooth like a soup that's been put through a blender. Instead it was a little bit lumpy — it's these density fluctuations that are imprinted in the cosmic microwave background. And they are not completely random. Using the mathematics of fluid dynamics and gravity, physicists can figure out what the fluid might have been doing in the time just up to the moment the CMB snapshot was taken. If there was a little more matter than average in a particular place, then that matter would exert a gravitational pull: even more matter would have been drawn into the over-dense region. However, the interaction between tightly packed matter and photons caused pressure to build up in these regions, eventually causing them to expand: particles were catapulted away until the pressure was relieved and gravity could take over again, pulling matter in. This would eventually cause the region to expand again. And so forth: the density of our initially over-dense region would start oscillating. Since ordinary sound waves, the ones that allow us to hear things, are also fluctuations of density (this time of air molecules), these cosmic oscillations are called baryon acoustic waves. Throwing its weight into this process was also dark matter. Like ordinary matter, dark matter interacts with other matter through the force of gravity, but unlike ordinary matter it doesn't interact with photons (light), so we can't actually see it. Physicists don't know what dark matter is made of, but they have inferred it must exist from the gravitational pull it exerts on matter we can see (find out more here). Dark matter was also attracted to over-dense regions and added its gravitational pull to that of ordinary matter, but since it doesn't interact with photons, it wasn't catapulted away when the pressure in a particular region built up to blowing point. Physicists believe that over-dense regions (enhanced by dark matter) of all sizes existed all over the place, oscillating at all frequencies and interacting, causing a general mess of density fluctuations in the baryon-photon fluid. The CMB picture comes from the time at which photons were released from the fluid and started their journey towards us, around 380,000 years after the Big Bang. (Before that time the photons' journey was impeded as they were scattered by free electrons — as the Universe cooled these free electrons were bound to the nuclei of newly-formed neutral atoms, and the photons were released.) The differences in density of matter influenced the temperature of the CMB photons. It's possible to work out exactly how the temperature would vary as a result of the density fluctuations, so cosmologists can figure out what the CMB picture should look like. Those density fluctuations that show up as particularly noticeable temperature fluctuations come from baryonic acoustic oscillations that had just reached a maximum, or minimum, at the time the CMB picture was taken. As you can glean from this brief, and over-simplified, explanation, the exact nature of the baryon acoustic waves depends on the make-up of the early Universe. It depends on the amounts of ordinary and dark matter, since these provide the necessary gravitational pull. But it also depends on the geometry of the Universe — the paths CMB photons had to take to get to us — and the amount of another mysterious substance, dark energy, which drives the accelerated expansion of the Universe and therefore also has a hand in how the CMB picture looks to us. And this is why the CMB picture can tell us so much. Cosmologists' calculations of what the CMB picture should look like depend on a number of parameters, including the quantities we have just mentioned: the amounts of ordinary and dark matter, the geometry of the Universe, and the amount of dark energy (see here for more on this cosmological model). Cosmologists can vary these parameters until they get a CMB that looks exactly like the one they have observed in reality. The fact that they have succeeded in doing so not only lends credence to their theoretical description, it also pins down the values of those important quantities that define the nature of our Universe. In this way, the CMB has turned cosmology into a precision science. Comparing modelled CMB pictures with the real one, cosmologists can estimate their parameters with a greater precision than they have ever been able before. The guiding light in all this is the lovely undulating curve shown below, called the power spectrum of the CMB. All the information is hidden within the configuration of peaks of this curve, as we shall see in the next article. 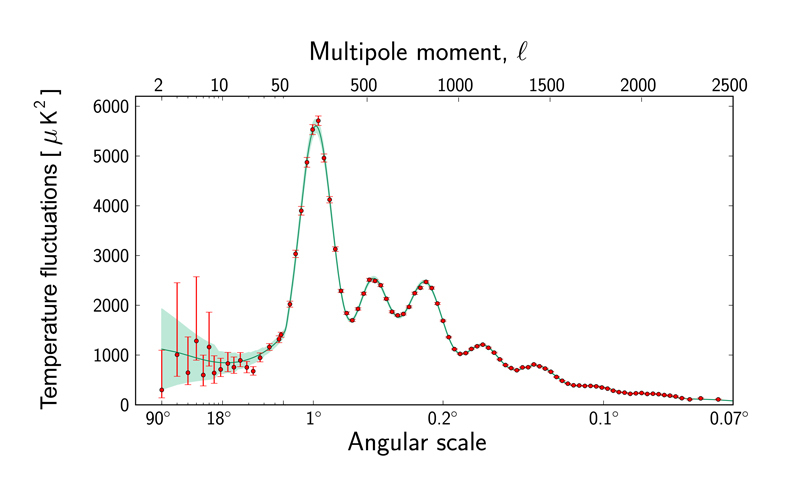 The power spectrum of the CMB. Image © ESA and the Planck Collaboration. Marianne Freiberger is Editor of Plus. She would like to thank Hiranya Peiris, Professor of Astrophysics at University College London, for invaluable help with writing it. This article is part of our Who's watching? The physics of observers project, run in collaboration with FQXi. Click here to see more articles about the cosmic microwave background.